After being exhilarated by the Olympics on TV, now we have to sit through the political conventions before we can get back to normal television programming. But lately, I'm beginning to think the Democrat party has changed its name. The party leader declared 'this Democratic" meeting open. Isn't the party's name -- the Democrat Party? How come in the past few years, so many people call it "the Democratic Party?" All over the media, pundits use the word "Democratic" instead of the word "Democrat" when talking about the Democrat political party. As a person who works with words, I find it offensive when people use words wrong. Wow -- even Google is using it when linking to Democrat web pages -- probably because the web page writers put that word in the 'searchable terms' area of the page. Try it -- go search Democrat in Google and check out what the first few links are called. Watch live video of the Democratic National Convention in Denver! I rest my case. They've changed their name. Sorry folks -- democratic is a way of electing government officials - the way of democracy/ the democratic way. The United States of America has a democratic type of government. The political party is the Democrat Party. 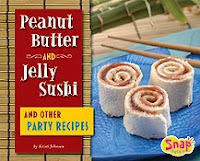 Peanut Butter and Jelly Sushi and other party Recipes by Kristi Johnson. A Snap Book from Capstone Press, 2008. Available now. It's the end of August and a young person's mind turns to -- SCHOOL? Actually, they're probably trying to think of new things for their favorite class -- Lunch. Crustless frozen peanutbutter and Jelly sandwiches? how about Peanut Butter and Jelly Sushi? No -- really. The Peanut Butter and jelly sushi on the cover actually look like they'd taste pretty good. This easy cookbook is perfect for young fingers. Step by step instructions create goodies suitable for slumber parties, anytime parties, and even school lunchbags. Photographs show ways to display your finished product. And there's even a sidebar for every receipe offering tidbits about the dish -- page 9 explains what's inside real Japanese sushi. Especially helpful is the Tools Glossary which not only explains the kitchen tools mentioned in the book, but shows the young reader pictures of them. Neat! Good Lord. Here I was hesitant to mention my Halloween book in August for fear it would be too early to do so, and over at La Bloga they're discussing Day of the Dead books. One is a really neat craft book. The 8-year old and I saw a whole aisle of Halloween stuff on the shelves at our local grocery store. Anywho -- somebody's looking forward to Halloween 'cause Amazon.com shows a goodly lot of sales for the Halloween Book of Facts and Fun. Which means that next May I might see some royalties from it. Hooray! In September I'll have a contest featuring my Halloween book. The prize -- copies of the book, of course. Watch this spot. Healthy Snacks by Mari C. Schuh. 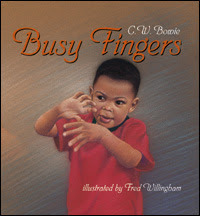 A Pebble Plus book from Capstone Press, 2006. Part of the Eating with MyPyramid series. 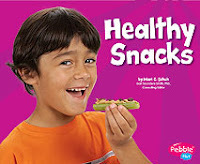 How can we entice kids to eat healthy snacks, instead of over processed, fatty ones? This book aims at the Kindergarten/ first grade new reader by using several sentences on the left and a photograph which bleeds all the way out to the edges on the right. It's not in the taller than wide easy reader format, though. It's in a wider than tall picture book format. Which means that our library has placed it in the nonfiction cook book area, not in the easy reader nonfiction. Since this series's purpose is to explain the 'new' food pyramid, it includes a picture of it with a suggestion to go to the government website for more information. Hmm, sending you to a website doesn't sound helpful, does it? Ah, the next page lists the food groups from the pyramid. The photographs are multi-racial, multi-generational, and I even saw a downs syndrome child in one. 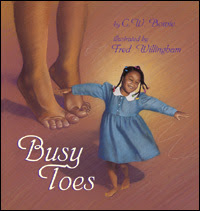 More links to Nonfiction Monday book reviews can be seen here. There are only three more days left for the County-wide library's Summer Reading program. Saturday is the last day kids can turn in their list of 10 books read this summer and get their prize. (a book) Middle Schoolers and High Schoolers only had to read three. And the little non-readers can turn in a list of 25 books people have read to them. (and get a book and a pre-cut bee.) And the kids have been pouring in this week. We have lists of 'completers' from each of the local schools decorating our Children's room. Plus pictures of bugs and butterflies all over the wall. The actual, factual butterflies are still on display, flitting around their little butterfly cage. Plus -- we have our new wide screen TV out in the library showing the Olympics. Olympic fever has hit all over. The 8 year old stays up watching the Olympics every night -- until she simply falls asleep and we have to put her to bed. Even her day care/ summer camp is celebrating the Olympics this week and next. They had a parade of nations on Tuesday. She was inspired by the olympics four years ago to begin gymnastics, which she continues taking today -- as a recreational sport. Although she was invited to try out for the junior team, because we both work full time, we just couldn't manage to get her to the 12 hours of practice a week necessary for team members. We do good getting her to her one hour a week. She's fastinated by our Maryland swimmer, Michael Phelps. I'm hoping she watches his swimming technique so that when she swims on the swim team next summer, she'll be even faster than she was this summer. "A good review should inform, and educate, and also illuminate the work under discussion. It should put the work in context of what has been done. The rest of the butterflies have emerged. 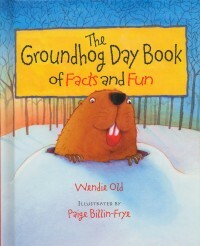 We now have five winners who guessed the correct day in my library -- and one person who guessed correctly on this Blog. Hurrah for everyone. One butterfly hatched at 10:15 am today. Only one person guessed today's date -- one of our teen volunteers at my library. I was all set to do a Nonfiction Monday review. I picked a book new to our library and brought it home and everything. Turns out the book was published in 2006. I was going to give it a so-so review anyway, because it didn't quite meet the need I had intended it for, but 2006? One of my self-imposed rules for these Monday reviews is that the book be somewhat new. Maybe I'll find a good one tomorrow and post it then. Right now I've got to light a fire under the 8-year old and take her book away from her and get her to bed. 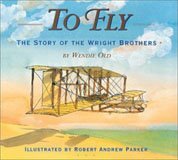 It's hard for me to do, because she has a summer reading biography assignment and she's in her bedroom reading my book -- To Fly, the Story of the Wright Brothers. But bedtime is bedtime. I apologize to anyone who tried to enter my butterfly guessing contest (see below) and couldn't get through. For some reason, that I don't understand, blogger blocked my blog. (I love alliteration, don't you? I guess blogger does too. Is it offensive to talk about writing and butterflies and libraries and books? You tell me. In celebration, I invite all of you to mosey on over to Alice Pope's blog. She is at the Society of Children's Book Writers and Illustrators' National conference in Los Angeles and is blogging about the sessions she attends.